The book refutes the sceptics of the immediate post-Games era that the Park would not become a valuable community asset. It traces how a sports park has been transformed to become ‘a new piece of the city’ as Lawrence Nield, the principal author of the 1995 Olympic Master Plan, put it. Lavishly illustrated and based on some 50 interviews the book tells the story of both the Park itself and the people involved in its realisation. 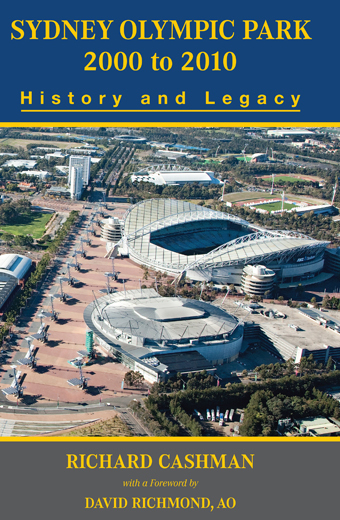 ‘Richard Cashman’s work capably captures and crystallises the events and circumstances’ of the history and legacy of Sydney Olympic Park ‘and at the same time provides an analytical assessment of the results to date’ (David Richmond AO, Foreword). Sydney Olympic Park has promoted a new and unique model post-Games legacy in that it has combined sports and environmental legacies with commercial development. This development of the Town Centre by the private sector—where hotels, banks, offices and residential towers have mushroomed since 2000—has helped offset the costs of community assets, such as the Parklands. After a slow beginning Sydney Olympic Park has proven a success story. The number of people visiting the Park has doubled in the past decade and will more than double that number again by the time of the realisation of the 2030 Master Plan. The story of Sydney Olympic Park is important to tell because it generated much bad press in 2001 and 2002 when many local and international sceptics proclaimed it to be a white elephant. Another reason why the record of the Park should be made public is that the scale of investment in this Park has been much larger than any previous public development in Sydney or in urban Australia, such as Darling Harbour or Centennial Park. Sydney Olympic Park is important because to many people it is a special and symbolic place. It was etched into the memory of Sydneysiders and Australians who remember the Games with much fondness and nostalgia.